August von Kruse was born in Wiesbaden in 1779. His father, Karl Friedrich von Kruse (1737–1806), a state official in the service of Nassau-Usingen, wrote several books on husbandry and household management, including Lehrbegriffs der Landwirtschaft und Haushaltungskunste for the Naussau schools in 1780, and Wahren Darstellung der grossen französichen Staatsrevolutions in 1790, which entered into several printings. His mother was Philippina Catherina von Bitburg; he was their only son. Against the wishes of his father, at the age of 17 he joined the military. For seven years he served in the military of the Prince of Brunswick-Lüneburg. On 1 July 1803, he accepted a commission as a captain in the Nassau-Weilburg military. At that time, the army of the principality consisted of two companies. With the merger of the principality of Nassau Weilburg with Nassau, the army expanded considerably, and Kruse received the rank of major. As a client state of France, Nassau supported Napoleon in the Prussian campaign of 1806. By the end of the campaign, Kruse had been promoted to lieutenant colonel. In the summer of 1808, Kruse commanded the 2nd Nassau Infantry Regiment No. 88, and fought for the French in the Peninsular War. On 13 October 1808, the regiment crossed the Spanish border. The Nasssauers participated in 42 battles, including the Battle of Vitoria on 21 June 1813. 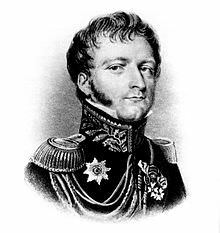 On 10 December 1813, as Napoleon’s empire crumbled in northern Europe, Kruse received secret orders from the Duke and the Prince of Orange to join the British. He carefully maneuvered his men so they could march to the British line, upon which he announced their change of allegiance. von Kruse’s decorations included the Grand Cross with Diamonds of the Imperial Russian Order of St. Anne, the Legion of Honour, Nassau’s silver Waterloo Medal, and the insignia of a Knight of the Royal Netherlands Military Willems-Order. As a reward for his service, in 1822 the Duke gave Kruse received a farm by Eisenbach, in the Taunus. On this 58 hectares (143 acres) farm, he experimented with new methods of construction and cattle breeding, and published his findings, which formed the basis of new practices in farm management. He also experimented in the development of social networks to alleviate widespread suffering, such as alcohol abuse. Kruse married Baroness Henriette von Dungern, who died in 1873, and they are both buried on the farm.